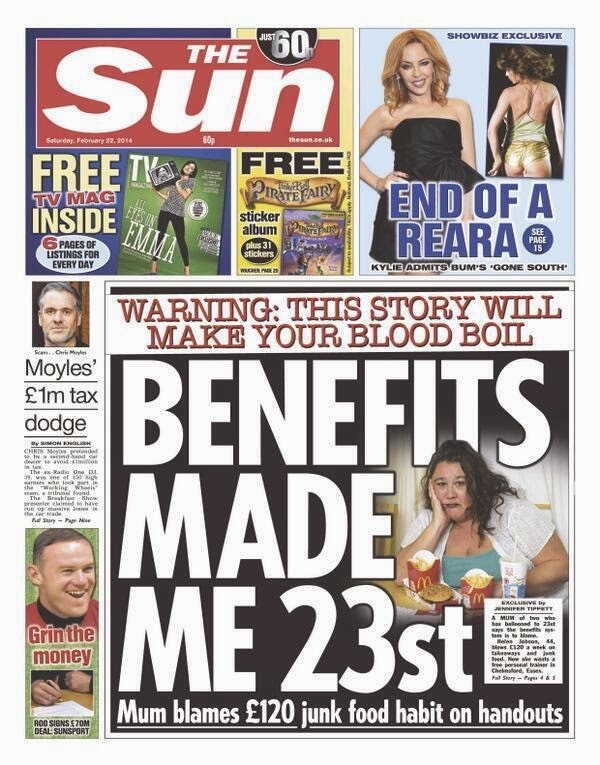 Today's front page of The S*n: Main story with emotional response instructions in red block capitals: Person claims £120 in benefits. Single column side story: Millionaire state employee fraudulently evades £1,000,000 tax. Small third story: Millionaire trousers a further £70,000,000 - his annual dodging of £600,000 tax unmentioned. Brought to you by a billionaire proprietor who has dodged billions of pounds in tax over decades. Barton Moss near Manchester has been the front line of the anti-fracking campaign in the UK. Police have shown a predictable level of impartiality. They arrived one rainy day saying that a flare had been fired at a police helicopter two days earlier, cordoned off the tents and undertook searches that involved pulling out everyone's clothes and bedding and leaving it in the rain. Had there actually been any such flare fired the police would not have left it two days to come and investigate. Older protesters are taken away from the site by the police using a favourite pretext for action with no legal basis, 'for your own safety'. They have arrested people on a range of trumped up charges. Perhaps the most extraordinary is the incident of a non-protesting Lawful Observer, Dr Steven Peers, who was shooed away from filming an arrest and then arrested for drink-driving even though he was a sober pedestrian. Top tip; don't fit up a person whose role is to film things until you've checked their camera is switched off. Prosecutors dropped the case as soon as it got to court and he is now suing the police for wrongful arrest and false imprisonment. Most of the arrests have been whilst walking in front of the delivery trucks. Enclosed in a moving kettle of officers who tread on their heels and kick their ankles, people walk slowly down the access road ahead of the convoy as it arrives in the morning and leaves in the evening. Around fifty people, myself included, have been arrested. Like many of those nicked, I wasn't doing anything that the others weren't, but they tend to pick off the new arrivals or the veterans of other protest camps. The access road isn't a normal road. It's a private road and a public footpath. 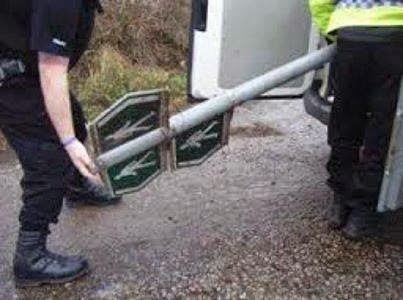 The police dug up and nicked the public footpath sign in December, but this does nothing to the legal status of the place. They were told repeatedly, every day, including just before arresting me, that it was a public footpath and Obstruction of The Highway doesn't apply and such arrests were unlawful. Yesterday a judge at Manchester Magistrates Court confirmed this. So today people sat in front of the trucks and stopped them for eight hours until the convoy turned around and went away. The police will now have to fall back on their slurs of protesters turning up for a ruck with the police and what a great job the police are doing of resisting such rabid provocation. That imaginative press release is believed to be tipped for the Man Booker shortlist, though it will face stiff competition from my strikingly creative arresting officer's statement. I have never seen a UK environmental campaign that looks so likely to win as the one against fracking. It has the vulnerable fledgling industry element that made the GM campaign successful. Then there is the robust mix of locals, direct activists and NGOs all doing what they do best and working in concert that made the roads campaigns so successful. It has the climate imperative underneath and the sense that drastic looking measures are the only ones that square up to the problem, elements that made the climate camps capture the imagination and move the grounds of debate. Cuadrilla, the company that had the fracking operation in Balcombe last year, announced a fortnight ago that they were pulling out of all their Lancashire sites. A couple of days later climate denying fuckweasel Environment Secretary Owen Paterson admitted that the protesters are winning the argument, though he didn't say it was due to having better values, science and facts. He attributed it to us having 'exciting clothes'. Last week BP ruled out any fracking in the UK, plainly saying it was because of the protests it would attract. Each new poll shows public opposition to fracking increasing. When the Hillsborough Independent Panel report came out the Prime Minister admitted the families had suffered 'a double injustice'; the disaster itself, and the smears and cover up from police. Today in parliament Steve Rotheram MP says there was a triple injustice - families were also spied upon by undercover police. Families report phone taps and break-ins without robbery. He plainly asked the Home Secretary Theresa May to confirm the spying didn't happen. She dodged it. Theresa May also said it was 'extremely unfortunate' that police forces didn't give all Hillsborough material to the Independent Panel as they had promised to do. The "Independent" Police Complaints Commission has already recovered 2,500 South Yorkshire police pocket notebooks not available to previous investigations. Thirteen officers have refused to be interviewed by the IPCC and two have not replied. We know that the secret police sought to protect society from threats. They did not distinguish between a threat to life and limb, a threat to public order, a threat to corporate profit or a threat police credibility. They put officers into numerous black justice campaigns to deny justice, not just that of Stephen Lawrence's family. Those campaigns sought to do was expose the police for what they actually were; institutionally corrupt and concerned with protecting their reputation more than admitting wrongdoing, providing answers to those who deserved them and allowing justice. Spying on the Hillsborough families fits squarely into that remit. Today, nearly 25 years on, that injustice continues. This is yet another strand that need to be included in the one all-encompassing, trusted and truly independent inquiry into the undercover policing scandal. 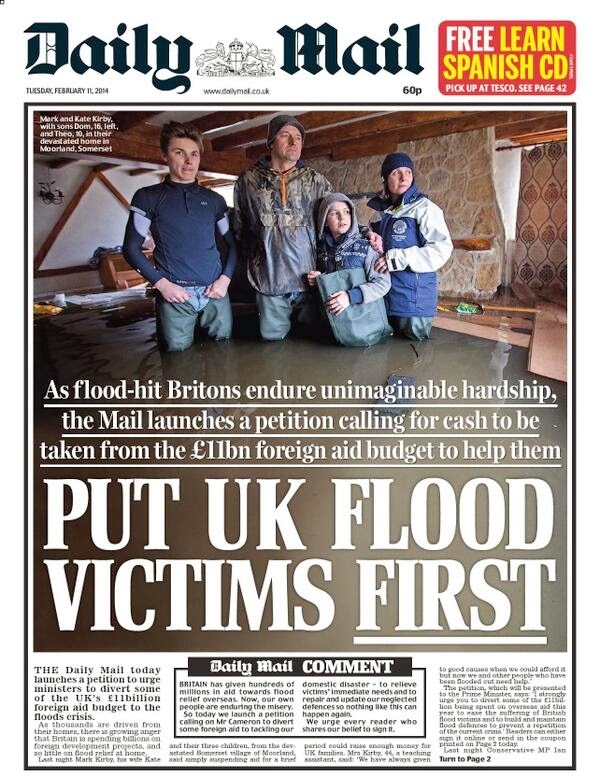 Remember folks, the lack of adequate flood defence and relief is because all the money goes on foreign aid, not because flood funding was slashed to fund tax cuts for the super rich. We are the fourth biggest economy on earth because of our own hard work and natural superiority, and not because we spend several centuries looting the wealth of countries that we now throw the odd crumb of aid to on condition they let our corporate interests cherry pick their economy. Whilst we are the fourth biggest economy, we are far from being the fourth-richest nation measured by average incomes. One that is rather better off on a per capita basis is Norway, which in the 1980s decided to keep 51% state ownership of its valuable (and finite) North Sea Oil resources, instead of chucking all that to the private sector. It has since been able to afford to protect its infrastructure from the very high levels of rainfall it endures. And also a load of that social democratic stuff too. you can go to university for free in Norway, even if you're from Eritrea. Meanwhile, in the UK, we're told the coffers are empty, but since the 2008 banking crisis, banks have paid more than twice as much in bonuses as they have in corporation tax. As the Met Office links the floods with climate change, long term flood prevention should have a focus on climate change abatement measures. Instead, the government has slashed such funding even when it saved far more money than it cost.